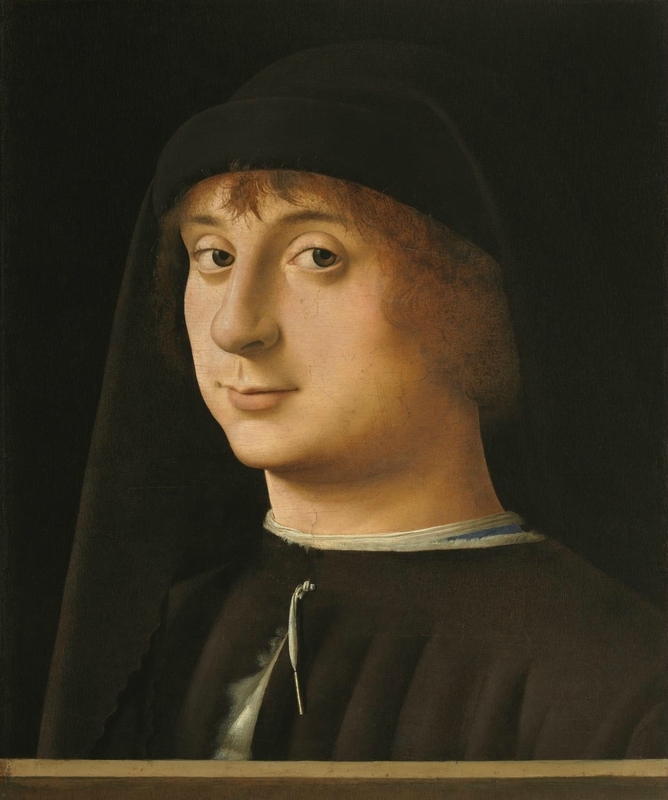 Antonello da Messina (Antonello di Giovanni di Michele de Antonio), Italian (active Messina, Naples, and Venice), 1456- 1479, Portrait of a Young Gentleman, 1474. Oil on panel, 12 5/8 x 10 11/16 inches (32.1 x 27.1 cm). Philadelphia Museum of Art, John G. Johnson Collection, 1917. © 2017 Philadelphia Museum of Art. 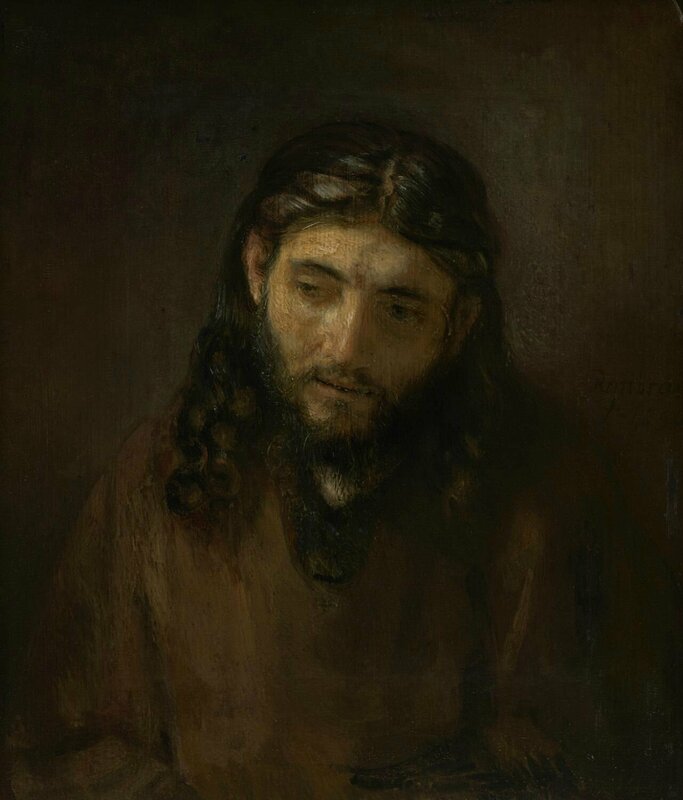 PHILADELPHIA - This fall, the Philadelphia Museum of Art will present Old Masters Now: Celebrating the Johnson Collection, a major exhibition focusing on one of the finest collections of European art ever to have been formed in the United States by a private collector. The exhibition marks the centenary of the remarkable bequest of John Graver Johnson—a distinguished corporate lawyer of his day and one of its most adventurous art collectors—to the city of Philadelphia in 1917. It also coincides with the celebration of the centennial of the Benjamin Franklin Parkway. The exhibition will include masterpieces by key figures of the Renaissance such as Botticelli, Bosch, and Titian; important seventeenth-century Dutch paintings by Rembrandt, Jan Steen, and others; and works by American and French masters of Johnson’s own time, most notably Winslow Homer, John Singer Sargent, Édouard Manet and Claude Monet. Old Masters Now will also provide a behind-the-scenes look at the collaborative work of the Museum’s curators and conservators who have worked with the collection since it was entrusted to the Museum’s care in the early 1930s. The exhibition will explore a host of fascinating questions ranging from attribution to authenticity and illuminate the detective work and problem-solving skills that are brought to bear when specialists reevaluate the original meaning and intent of works created centuries ago. The exhibition will open with a gallery dedicated to Johnson himself, providing a picture of one of Philadelphia’s most prominent leaders during the late nineteenth and early twentieth centuries. A timeline will trace key moments in his colorful legal career, highlighting important cases and invitations he was reported to have received from President Garfield and President Cleveland to be nominated for a seat on the Supreme Court, and another from President McKinley to serve as his Attorney General, all of which Johnson declined. It notes that in 1901, he represented his hometown baseball team, the Phillies (then known as the Philadelphia Ball Club), when players sought to break their contract to play for another team. This section will also explore his decades-long formation of an art collection, from his early acquisitions of contemporary art, such as Mary Cassatt’s On the Balcony, to paintings that he acquired the day before he died. Archival material, travel albums, and large-scale photographs of the interiors of Johnson’s houses at 426 and 506 South Broad Street will reveal the strikingly idiosyncratic way in which he displayed and lived with his collection. Eight paintings in the exhibition will illustrate some of the fascinating breakthroughs in understanding that have emerged from curators’ and conservators’ work researching and caring for the collection over time. 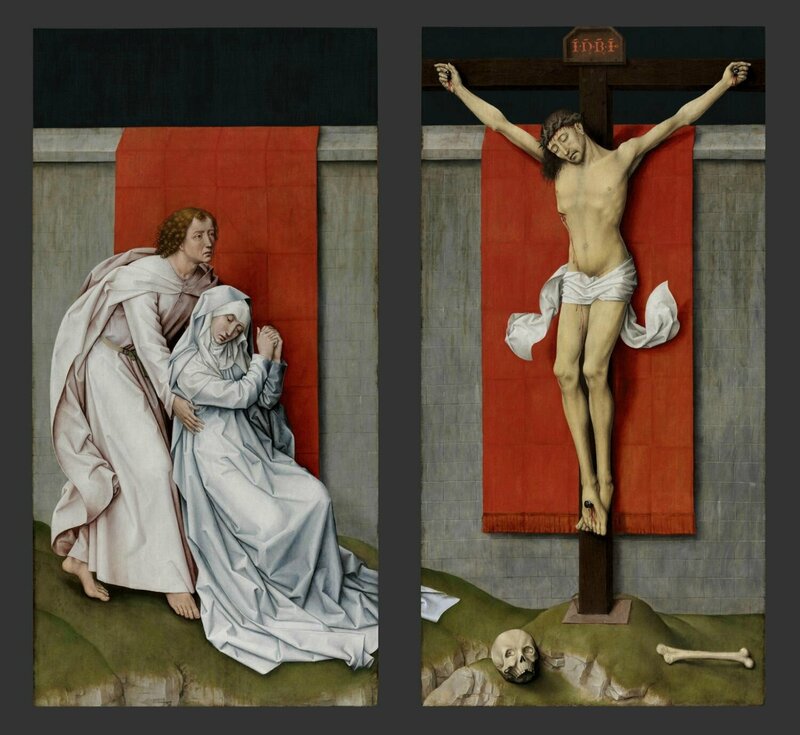 Among them is Rogier van der Weyden’s The Crucifixion, with Virgin and Saint John the Evangelist Mourning, from around 1460. This pair of wood panels long puzzled scholars, who were uncertain whether they were created as part of an altarpiece or as an independent work. A conservator’s close technical study eventually led to the realization that they had served as shutters that closed over what was likely one of the largest altarpieces made during the Renaissance in northern Europe, its existence is known only through the Johnson Collection paintings and two others discovered in 2012. Rogier van der Weyden, Netherlandish (active Tournai and Brussels), 1399/1400 - 1464, The Crucifixion, with the Virgin and Saint John the Evangelist Mourning, c. 1460. Oil on panel, 71 inches × 6 feet 1 3/8 inches (180.3 × 186.4 cm). Philadelphia Museum of Art, John G. Johnson Collection, 1917. © 2017 Philadelphia Museum of Art. Descent from the Cross, painted by the Netherlandish artist Joos van Cleve around 1520, has undergone a year-long conservation treatment and will be placed on view for the first time in thirty years. 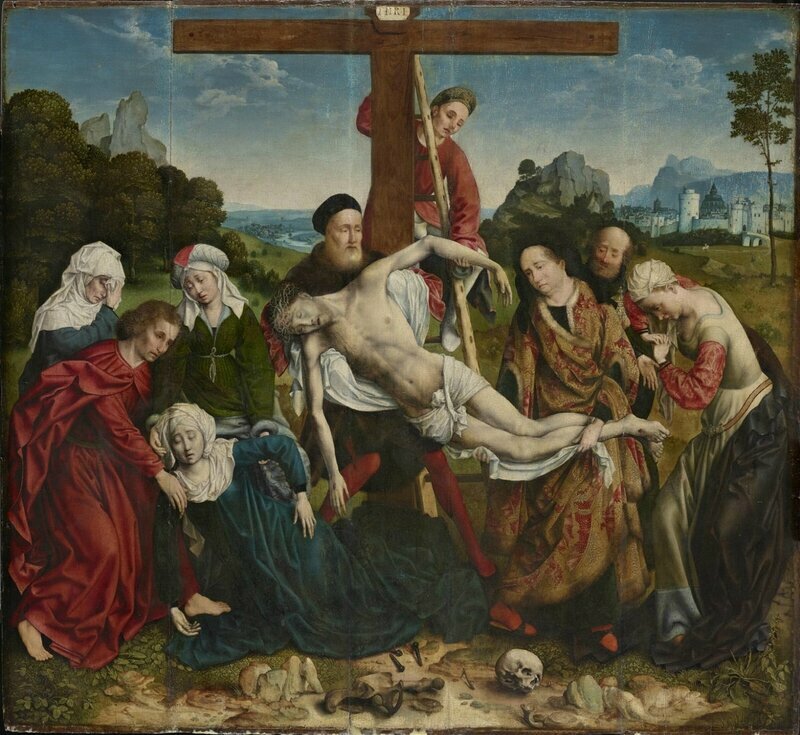 Once considered to be simply a copy of a major painting of the same subject created by Rogier van der Weyden eight decades earlier, it remained in storage as a study picture. The painting is now considered to be Joos van Cleve’s homage to this revered masterpiece. Joos van Cleve, Netherlandish (active Antwerp and France), 1511-1540/41, The Descent from the Cross, c. 1518-1520. Oil on panel, 45 1/4 x 49 3/4 inches (114.9 x 126.4 cm). Philadelphia Museum of Art, John G. Johnson Collection, 1917. © 2017 Philadelphia Museum of Art. 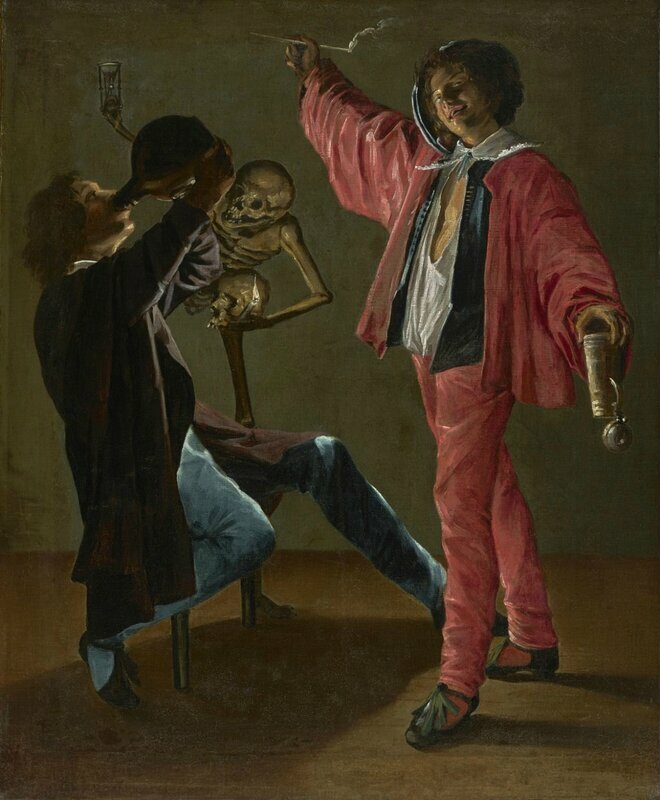 Another work that illustrates how historical and technical study may recover an artist’s original meaning is Dutch master Judith Leyster’s painting The Last Drop (The Gay Cavalier). Dating to about 1629, it depicts a scene of two men approaching the end of a night of drinking. In 1979, an art historian discovered an early copy of the painting that included a skeleton—a warning to the revelers that they should change their ways. The Johnson painting showed no skeleton, but a conservator’s examination and microscopic cleaning tests in 1992 determined that though it once had been painted over, it remained beautifully intact. Removal of the overpainting, documented in a series of photographs, revealed the true message of Leyster’s painting. Judith Leyster, Dutch (active Haarlem and Amsterdam), 1609 - 1660, The Last Drop (The Gay Cavalier), c. 1639. Possibly a companion to 'The Merry Trio,' in the collection of P. L. Galjart, Netherlands. Oil on canvas, 35 1/16 x 28 15/16 inches (89.1 x 73.5 cm). Philadelphia Museum of Art, John G. Johnson Collection, 1917. © 2017 Philadelphia Museum of Art. 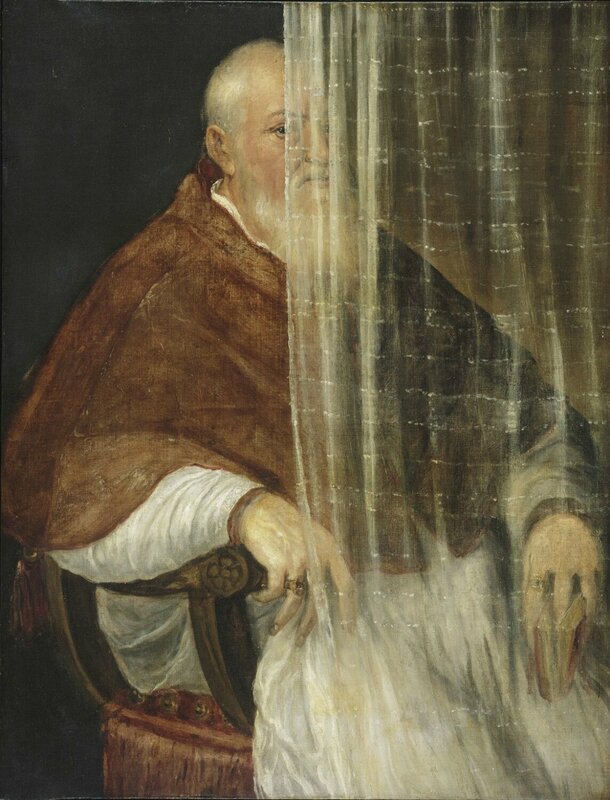 Titian’s enigmatic Portrait of Archbishop Filippo Archinto (1558) has been newly cleaned and restored following years of study and conservation treatment. It will be presented alongside a display illustrating how the artist’s original materials have changed with age. Recent analysis by Museum conservators and scientists revealed that Titian painted Archinto with a purple cloak, a color identified with archbishops. The blue pigment that contributed to the purple hue deteriorated over time, making the cloak appear red today. This discovery adds insight into how Titian’s contemporaries would have seen this masterful portrait. Titian (Tiziano Vecellio), Italian (active Venice), first securely documented 1508, died 1576, Portrait of Archbishop Filippo Archinto, 1558. Oil on canvas, 45 3/16 x 34 15/16 inches (114.8 x 88.7 cm). Philadelphia Museum of Art, John G. Johnson Collection, 1917. © 2017 Philadelphia Museum of Art. Attribution is examined in the section devoted to the Dutch master Hieronymus Bosch. Johnson was among the earliest Americans to collect Bosch, and today the Museum is among only a handful in the United States that possess a work by this great painter. Although Johnson purchased 10 works that he understood to be by the artist, close comparative looking and technical research—most notably through the use of dendrochronology (dating growth rings in wood)—has led to the conclusion that only one of these 10 works can be considered authentic today. 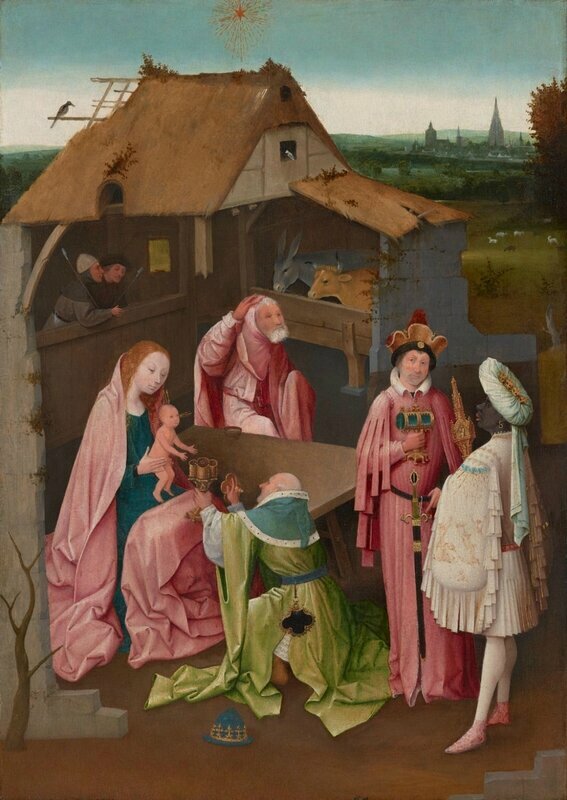 Hieronymus Bosch, Netherlandish (active Hertogenbosch), c. 1450 - 1516, The Adoration of the Magi, Early 16th century. Oil on panel, 30 1/2 × 22 inches (77.5 × 55.9 cm). Philadelphia Museum of Art, John G. Johnson Collection, 1917. © 2017 Philadelphia Museum of Art. The exhibition also explores those areas of European painting in which Johnson focused in depth, including Italian, Dutch and Netherlandish, and French art. The number of Dutch paintings he acquired was among the largest of his day, and is especially rich in landscapes by Jacob van Ruisdael and animated genre scenes by Jan Steen. Rembrandt’s Head of Christ will also be on view in this section. Rembrandt Harmensz. van Rijn, Dutch (active Leiden and Amsterdam), 1606 - 1669, Head of Christ, c. 1648-1656. Oil on oak panel, laid into larger oak panel, 14 1/8 x 12 5/16 inches (35.8 x 31.2 cm). Philadelphia Museum of Art, John G. Johnson Collection, 1917. © 2017 Philadelphia Museum of Art. One section devoted to some of the earliest works in Johnson’s collection explores how art historians and conservators evaluate the original context of works that today exist only as fragments of a larger whole. 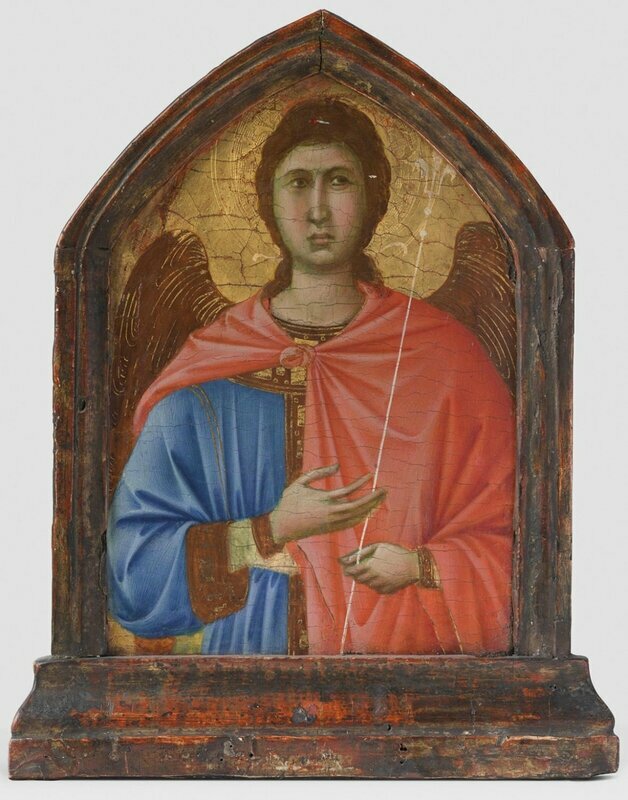 Here an image of the Sienese artist Duccio’s great altarpiece called the Maestá will be placed beside his workshop’s Angel, showing how it was placed and functioned within the larger composition. Other fragmentary works on view include four small superb paintings by Botticelli and Fra Angelico’s St. Francis of Assisi. Workshop of Duccio (Duccio di Buoninsegna), Italian (active Siena), 1278-1318, Angel, By 1311. Probably a pinnacle from Duccio's Maestà, from the Cathedral of Siena; cut and rounded at the top. Tempera and tooled gold on panel with vertical grain, 9 1/2 x 6 11/16 inches (24.1 x 17 cm). Philadelphia Museum of Art, John G. Johnson Collection, 1917. © 2017 Philadelphia Museum of Art. Sandro Botticelli (Alessandro di Mariano Filipepi), Italian (active Florence and Rome), 1445 - 1510, The Last Moments of Saint Mary Magdalene, c. 1484-1491. Predella panel from an altarpiece from the convent of Sant'Elisabetta delle Convertite, Florence. Tempera on panel, 7 3/16 x 17 1/4 inches (18.3 x 43.8 cm). Philadelphia Museum of Art, John G. Johnson Collection, 1917. © 2017 Philadelphia Museum of Art. Sandro Botticelli (Alessandro di Mariano Filipepi), Italian (active Florence and Rome), 1445 - 1510, The Feast in the House of Simon, c. 1484-1491. Predella panel from an altarpiece from the convent of Sant'Elisabetta delle Convertite, Florence. Tempera on panel, 7 13/16 x 17 3/16 inches (19.8 x 43.7 cm). Philadelphia Museum of Art, John G. Johnson Collection, 1917. © 2017 Philadelphia Museum of Art. Sandro Botticelli (Alessandro di Mariano Filipepi), Italian (active Florence and Rome), 1445 - 1510, Saint Mary Magdalene Listening to Christ Preach, c. 1484-1491. Predella panel from an altarpiece from the convent of Sant'Elisabetta delle Convertite, Florence. Tempera on panel, 7 7/8 x 17 1/4 inches (20 x 43.8 cm). Philadelphia Museum of Art, John G. Johnson Collection, 1917. © 2017 Philadelphia Museum of Art. Sandro Botticelli (Alessandro di Mariano Filipepi), Italian (active Florence and Rome), 1445 - 1510, "Noli Me Tangere", c. 1484-1491. Predella panel from an altarpiece from the convent of Sant'Elisabetta delle Convertite, Florence. Tempera on panel, 7 3/4 x 17 5/16 inches (19.7 x 44 cm). Philadelphia Museum of Art, John G. Johnson Collection, 1917. © 2017 Philadelphia Museum of Art. 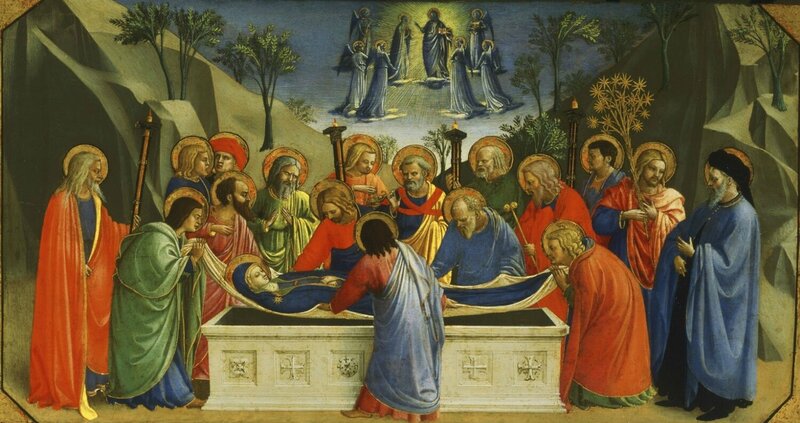 Fra Angelico (Guido di Pietro, also called Fra Giovanni da Fiesole), Italian (active Florence and Rome), first securely documented 1417, died 1455, Dormition of the Virgin, c. 1425. Predella panel of an altarpiece. Tempera and tooled gold on panel with horizontal grain, 10 1/4 x 20 13/16 inches (26 x 52.9 cm). Philadelphia Museum of Art, John G. Johnson Collection, 1917. © 2017 Philadelphia Museum of Art. Another section is devoted to Johnson’s fascination with the art of his time. It highlights Édouard Manet’s The Battle of the U.S.S. “Kearsarge” and the C.S.S. “Alabama,” James Abbott McNeill Whistler’s Purple and Rose: The Lange Leizen of the Six Marks, and major paintings by John Constable, Gustave Courbet, Edgar Degas, Winslow Homer, Camille Pissarro, Eduard Charlemont, and a marble by Auguste Rodin. 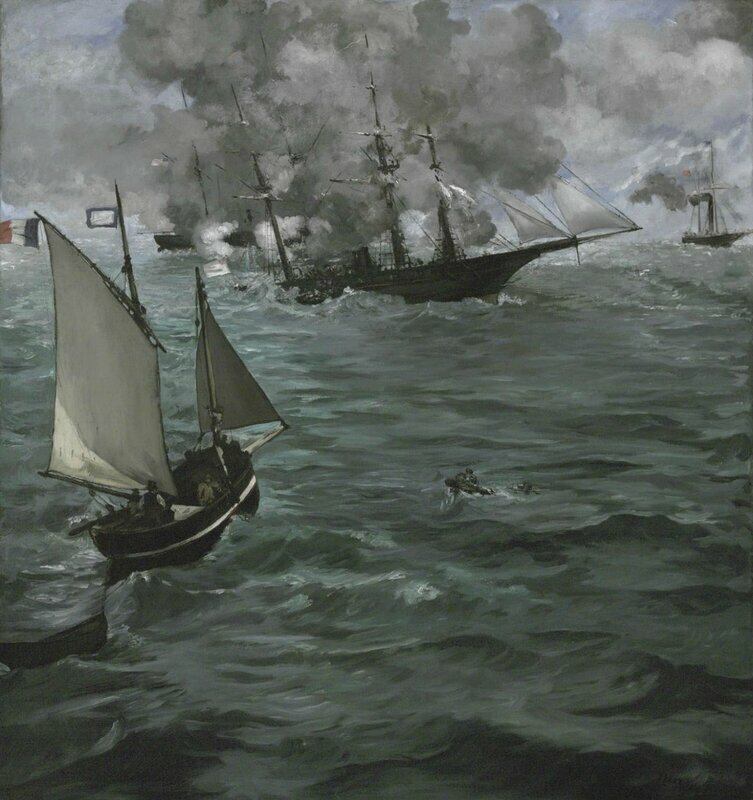 Édouard Manet, French, 1832 - 1883, The Battle of the U.S.S. "Kearsarge" and the C.S.S. "Alabama", 1864. Oil on canvas, 54 1/4 x 50 3/4 inches (137.8 x 128.9 cm). Philadelphia Museum of Art, John G. Johnson Collection, 1917. © 2017 Philadelphia Museum of Art. James Abbott McNeill Whistler, American (active England), 1834 - 1903, Purple and Rose: The Lange Leizen of the Six Marks, 1864. Oil on canvas, 36 3/4 x 24 1/8 inches (93.3 x 61.3 cm). Philadelphia Museum of Art, John G. Johnson Collection, 1917. © 2017 Philadelphia Museum of Art. During the presentation of the exhibition the Johnson curatorial and conservation team will be frequently available in the galleries to give talks and answer questions about the works on view. Visitors will also be encouraged to explore the European galleries, where other works from the Johnson Collection are also installed. One installation in gallery 273 is devoted to sculptures from the Johnson Collection and another to embroideries and other textiles from his collection. 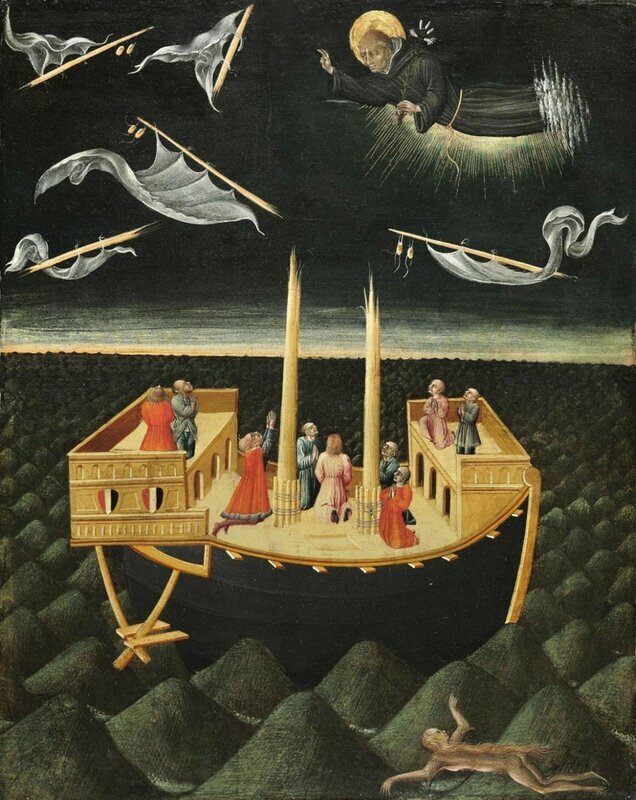 Giovanni di Paolo (Giovanni di Paolo di Grazia), Italian (active Siena), first documented 1417, died 1482, Saint Nicholas of Tolentino Saving a Shipwreck, 1457. Lateral panel of an altarpiece; companion panels are in the Gemäldegalerie der Akademie der Bildenden Künste, Vienna (inv. no. 1177), and Sant'Agostino, Montepulciano. Tempera and gold on panel with vertical grain, 20 1/2 x 16 5/8 inches (52.1 x 42.2 cm). Philadelphia Museum of Art, John G. Johnson Collection, 1917. © 2017 Philadelphia Museum of Art. The Museum is publishing its first digital catalogue to coincide with this centennial exhibition. The publication includes thematic essays, catalogue entries on objects from the Johnson Collection, and digitized archival resources. 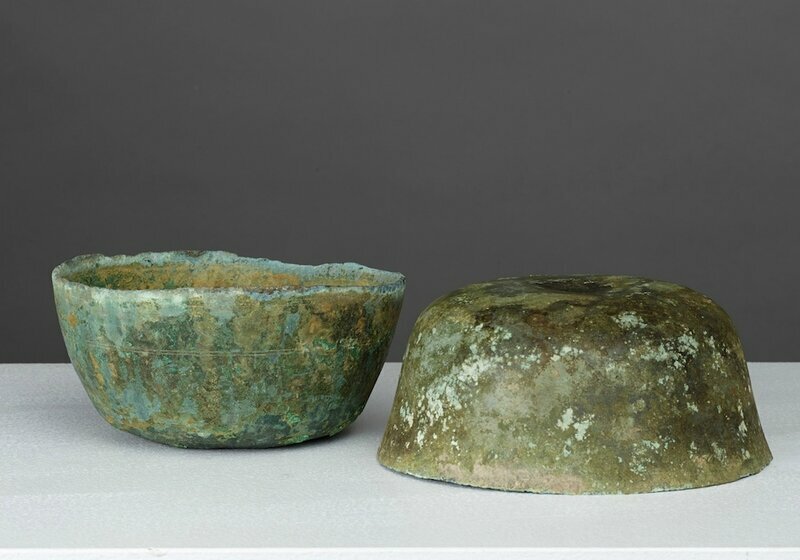 The essays focus on the history, scholarship on, and stewardship of this collection and are written by the Museum’s curatorial and conservation team. It will be available for free and accessible to researchers and the public alike. 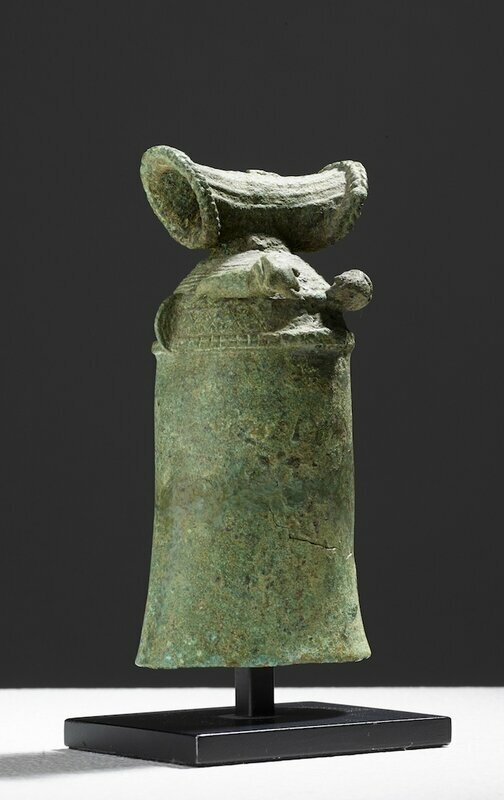 For this new digital publication, the Museum has made use of a new technology implementing IIIF (International Image Interoperability Framework) to present digital images in a more versatile and flexible way. 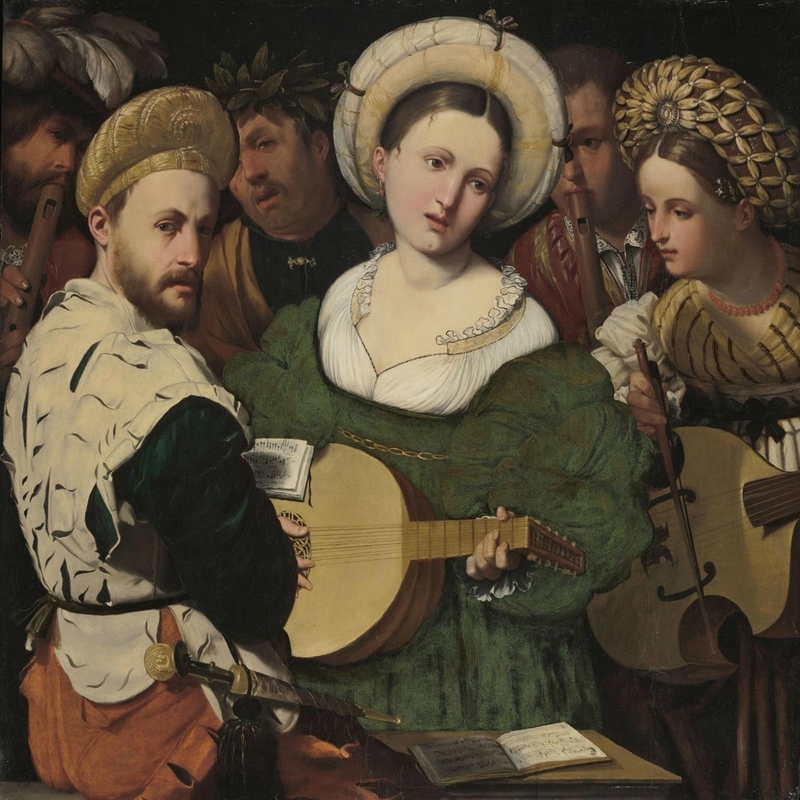 Callisto Piazza (Calisto de la Piaza da Lodi), Italian (active Lodi and Brescia), c. 1500 - 1561/62, Musical Group, 1520s. Oil on panel, 35 5/8 x 35 3/4 inches (90.5 x 90.8 cm). Philadelphia Museum of Art, John G. Johnson Collection, 1917. © 2017 Philadelphia Museum of Art. Born in the village of Chestnut Hill, now part of Philadelphia, and educated in the city’s public Central High School and then the University of Pennsylvania, Johnson became recognized as the greatest lawyer in the English-speaking world. He represented influential clients such as J. P. Morgan, US Steel, the Sugar Trust, and Standard Oil. He was also known to accept cases that many would consider ordinary if the details piqued his intellectual interest. Johnson quietly acquired many important works of art, but also highly singular ones that have been the source of much scholarly discussion. At the age of 34 he married Ida Alicia Powel Morrell (1840–1908), a widow with three children. He traveled to Europe often, visiting France, Switzerland, Italy, Austria, Germany, and Belgium, and collected pictures as an amateur art historian relying on his own evaluation. In 1892, he published Sight-Seeing in Berlin and Holland among Pictures. Also that year, he published a catalogue of his collection which at the time included 281 paintings. In 1895, Johnson was appointed to Philadelphia’s Fairmount Art Commission where he oversaw the Wilstach Gallery, which housed a public collection of paintings. Under his leadership, the Commission purchased important works, among them James McNeill Whistler’s Arrangement in Black, and Henry Ossawa Tanner’s Annunciation, the first work by an African-American artist to enter a public collection in the United States. Johnson was also the attorney for Alexander Cassatt, brother of the artist Mary Stevenson Cassatt. One of his earliest purchases was Cassatt’s On the Balcony. When Johnson gave this work to the Wilstach Gallery in 1906, it was the first painting by the artist to enter an American public collection. During his 22-year stewardship of the Wilstach Gallery, he made 53 gifts from his personal collection, which are now on view at the Museum. 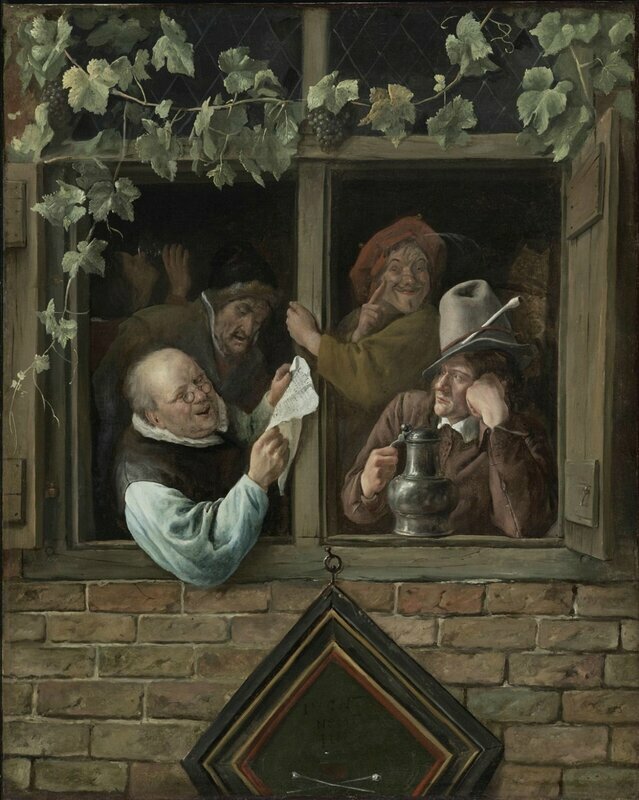 Jan Steen, Dutch (active Leiden, Haarlem, and The Hague), 1626 - 1679, Rhetoricians at a Window, 1658-1665. Oil on canvas, 29 7/8 x 23 1/16 inches (75.9 x 58.6 cm). Philadelphia Museum of Art, John G. Johnson Collection, 1917. © 2017 Philadelphia Museum of Art. 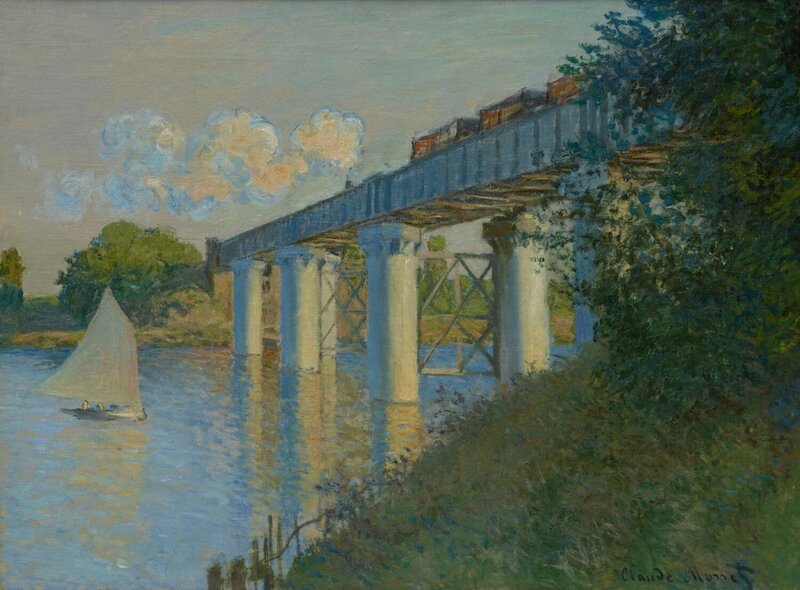 Claude Monet, French, 1840 - 1926, Railroad Bridge, Argenteuil, 1874. Oil on canvas, 21 3/8 x 28 7/8 inches (54.3 x 73.3 cm). Philadelphia Museum of Art, John G. Johnson Collection, 1917. © 2017 Philadelphia Museum of Art. 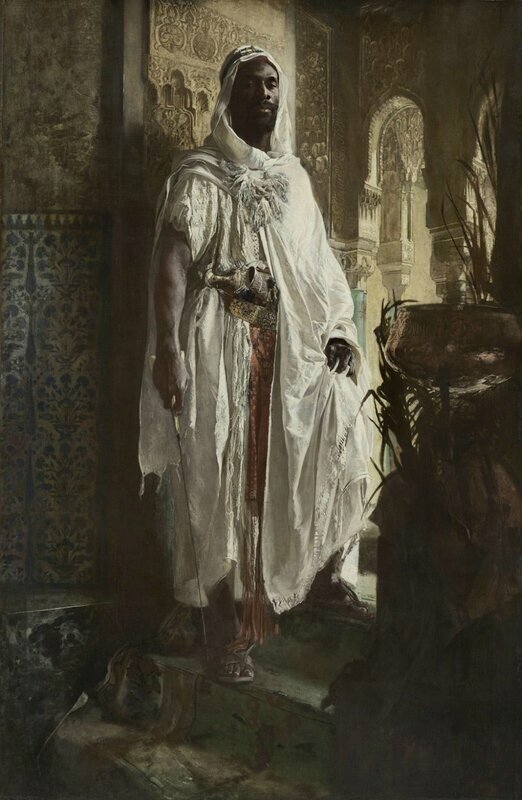 Eduard Charlemont, Austrian, 1848 - 1906, The Moorish Chief, 1878. Oil on panel, 59 1/8 x 38 1/2 inches (150.2 x 97.8 cm). 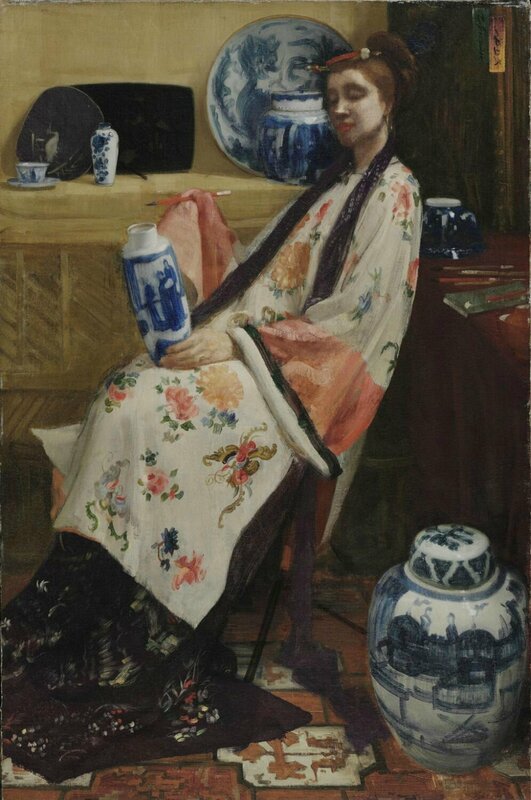 Philadelphia Museum of Art, John G. Johnson Collection, 1917. © 2017 Philadelphia Museum of Art.